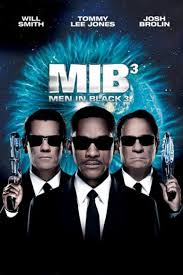 Men in Black III (2012) Rated PG-13 | What to Watch. Agent J travels back in time to the 60’s, when M.I.B. were just getting started, to save his partner Agent K from being assassinated by an alien. Starring Will Smith, Tommy Lee Jones, Josh Brolin, Jemaine Clement, Emma Thompson. I felt that, after ten years since the last M.I.B film, this movie retained the quality and spirit of the first two films and was very good. It kept true to the bromance of J and K. It also did a great job at keeping the time travel fairly simple, without adding too much confusion or over-the-top craziness. Josh Brolin looks and acts exactly like a young Tommy Lee Jones- very convincing. As the third of a trilogy, this film is surprisingly the better of the three. This film is worth a watch. This entry was posted in 2012, action, comedy, films, Movie reviews, movies, Rated PG-13, reviews, Sci-fi and tagged 60s, alien, assassinated, bromance, Emma Thompson, film, film reviews, films, jemaine clement, job, Josh Brolin, M.I.B., Men in Black 3, Men in Black III, MIB3, movie, movie reviews, movies, partner, ten, third, time, time travel, Tommy Lee Jones, trailer, travels, Trilogy, version, Will Smith, worth, years. Bookmark the permalink. Pingback: Josh Brolin | What to Watch.